The GFMC is located in Freiburg, Germany, and Ulaanbaatar, Mongolia. Directions via train (S-Bahn schedule between Freiburg Central Station and Airport Campus / GFMC) (valid until 31 January 2019; PDF, 0.6 MB). Note: Until mid 2019 the S-Bahn service is suspended due to renovation of the rails. 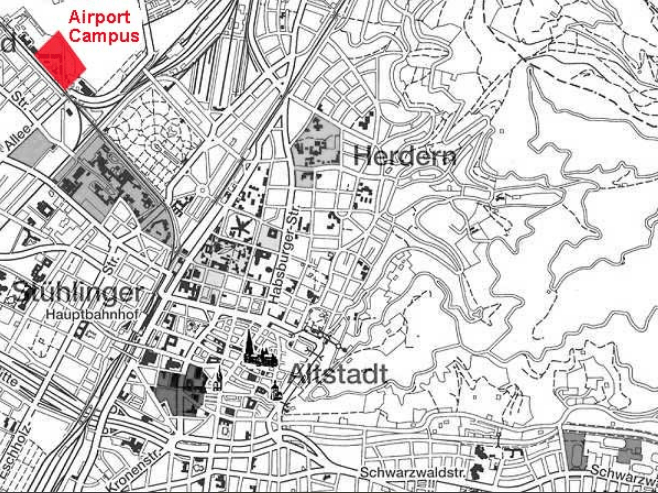 The Airport Campus of Freiburg University can be reached by local train (approx. 3 minutes). The train departs every 30 minutes from Freiburg “Hauptbahnhof” (main station) from platforms 5 or 6 (please verify!) in direction “Breisach”. Exit the train at the stop “Neue Messe / Universität”. Look for signs “Feuerökologie – 075”. From Freiburg “Hauptbahnhof” (main station), take the tram number 4 Line “Zähringen – Bertoldsbrunnen – Messe”. Exit the tram at the stop “Technische Fakultät”. Look for signs “Feuerökologie – 075”. Exit “Freiburg Mitte” and drive in direction city center. Take the third exit (at road sign “POLIZEI”) and turn left at the first traffic light which leads into the “Berliner Allee”. Now go straight until the road leads beneath a railway bridge. Turn left at first traffic light after passing beneath the railway bridge and enter the University Campus. Look for signs “Feuerökologie – 075” or “Global Fire Monitoring Center”. Basel: Arriving at the tri-national airport of Basel use the exit to France and take the shuttle bus to Freiburg Central Bus Station (at the Main Railway Station). See the bus schedule here. Zurich: There are train connections from Zurich Airport Railway Station to Freiburg (via Zurich Main Station and/or Basel) departing every full hour plus 4 and 43 minutes respectively. Average travel time is between 2 and 2.5 hours. Hotel Barbara is a family-style Hotel located in Poststrasse No. 4 (Tel. +49-761-296250, locally dial 296250 only; Fax +49-761-296250). Arriving at the Central Station by rail or by airport shuttle bus (from Basel-Mulhouse-Freiburg Airport) please go to the main exit of the station (50 m from arrival point of the Airport Shuttle. Go straight ahead towards downtown, entering Eisenbahnstrasse for ca. 150 m and turn next street to the left where you will find Hotel Barbara. Hotel Minerva is a similar family-style Hotel located 50 m down from Hotel Barbara (see above) in Poststrasse No. 8 (Tel. +49-761-386490, locally dial 386490 only; Fax +49-761-3864944). Arriving at the Central Station by rail or by airport shuttle bus (from Basel-Mulhouse-Freiburg Airport) please go to the main exit of the station (50 m from arrival point of the Airport Shuttle. Go straight ahead towards downtown, entering Eisenbahnstrasse for ca. 150 m and turn next street to the left where you will find Hotel Minerva. The hotel provides a cost-free ticket valid for all public transportation lines in Freiburg Region during the stay in the hotel. The ticket can be used for the very rapid S-Bahn shuttle connections between the “Hauptbahnhof” (main station) and the GFMC site (station “Neue Messe / Universität”) (see above). Park Hotel Post is located nearby, close to the corner between Eisenbahnstrasse and Poststrasse (Tel. +49-761-385480, locally dial 385480 only; Fax +49-761-31680). 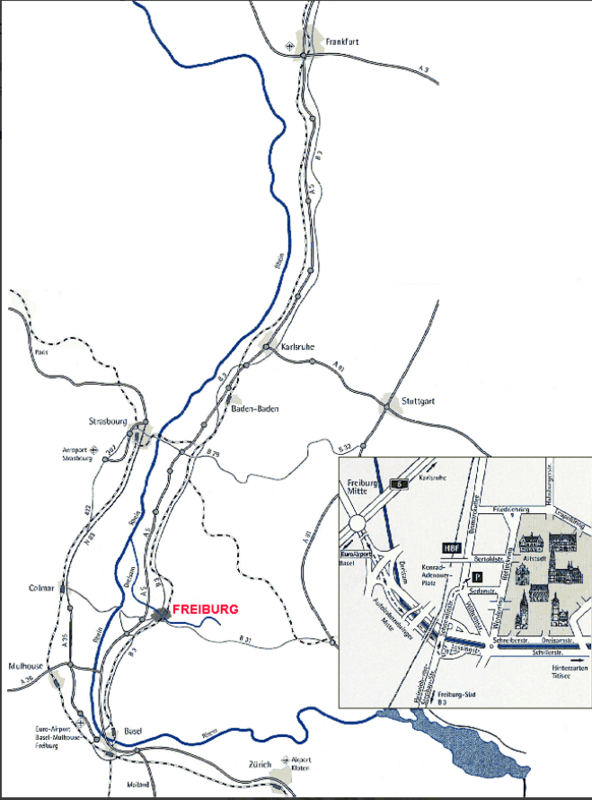 Arriving by car: The left map shows the greater Freiburg Area. Take the Autobahn exit Freiburg Mitte and drive downtown. Follow the traffic signs to Hauptbahnhof which is also marked HBF on the more detailed piece of the map inside the left map. 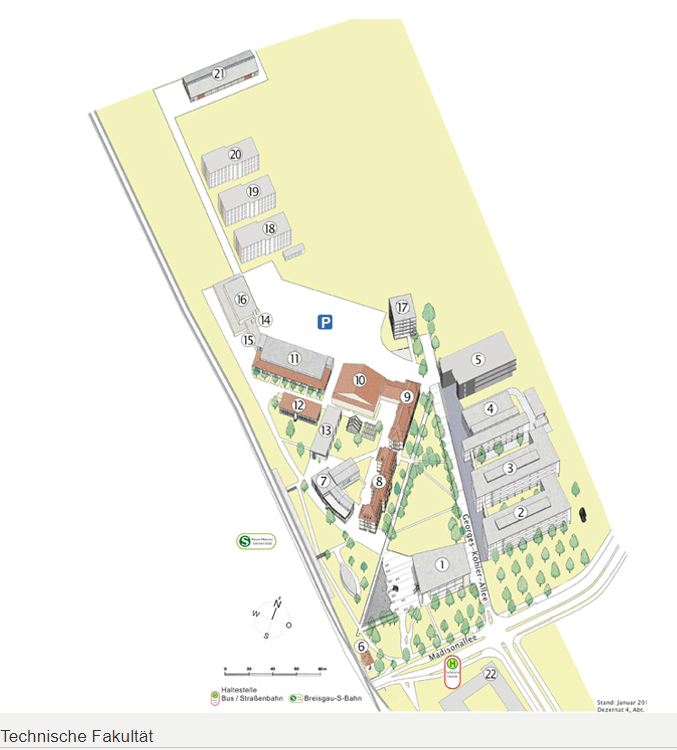 Use the central map of the GFMC website to identify Hauptbahnhof. Coming from the Autobahn you will be driving towards the center, then turn left and drive toward the Hauptbahnhof. Opposite the Hauptbahnhof main exit (Hauptbahnhof with Intercity Hotel must be on your left-hand side) turn right and enter Eisenbahnstrasse. Individual hotel booking: For those GFMC guests not booked through us, there are other hotels in the vicinity that can be reserved through Freiburg Incoming & Touristik (FIT), c/o TIBS GmbH, Yorckstraße 23, 79110 Freiburg (Tel: +49-761-88581-45).